Many pets enjoy riding along in the car, but that joy can often leave a mess in the interior. On this As Seen on TV, we’ll try out the Pet Rider, which promises protection when your pet is onboard. The Pet Rider fits on a rear bench seat of a vehicle but can also lay flat in the back on a van or SUV for larger pets. When unfolding the Pet Rider, it has adjustable straps that hook around the back head rests along with slots for seat belts to slip through so children can continue to ride in the back of the car with the pet if they so choose. If the pet has an accident or gets sick on the mat, it wipes right up. Rather than it running down to the floor, it pools on the seat where it can be wiped it up. The Pet Rider also claims to be claw and paw resistant. After some tests with a Phillips screw driver, it definitely proved that. The Pet Rider can be pulled out, shook with ease and folded back up for the next use. It is also machine washable. The pet rider worked well and could also be used for young children who have a tendency to toss food around and spill things. Nothing makes a dog happier than to go for a ride in the car, but pets leave behind hair and pet mess that are hard to remove. Now there’s Pet Rider™, the revolutionary pet seat cover made of a hair and stain resistant material that’s easy to clean. It installs in seconds in any car or truck or van. It works on bench seats, bucket seats and even fits perfectly in the back of large SUVs. Today as part of this special internet offer, you’ll get the Pet Rider, a $40 value, for the special introductory price of just $14.99 plus $6.99 shipping and handling. That’s a HUGE 50% discount! But that’s not all, we’ll double your order to include a second BONUS Pet Ridert-- you pay only a separate $6.99 processing fee. That’s a HUGE total savings over 50%! Order now and find out how you can get free shipping. 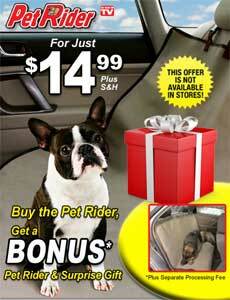 This special Pet Rider offer is not available in stores so the only way to get it is to place your order now!